The February WER report highlights the narrow range in which crude prices have been trading since OPEC implemented production cuts and discusses the outlook for breakout from this range over the several years. We provide details for several recent production floater LOIs, including an LOI for an FPSO for use offshore Vietnam and an LOI for up to seven regas carriers capable of use on future FSRU contracts. We also review the local content dispute that has stopped Petrobras from awarding the Libra Pilot and Sepia FPSO EPC contracts -- a dispute that will be difficult to resolve under the present social and political dynamics in Brazil. 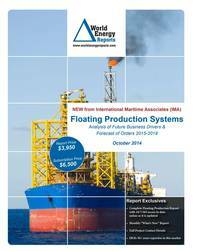 In the data section of the report are details for 198 floater projects in the planning stage, 48 production or storage floaters now on order, 293 floating production units currently in service and 28 production floaters available for redeployment contracts. Charts in the report update the location where floating production and storage systems are being planned, operating, being built and to be installed. Accompanying excel spreadsheets provide the report data in sortable format. Information is current as of 20 February.